East Khasi Hills (EKH) is one of the 11 districts of the state of Meghalaya, which is known as “The Abode of Clouds.” The natural beauty of the district where foaming waterfalls, caves, and gorges around it attracts tourists from different parts of the country and outside. The capital of the state Shillong is located in EKH district (EKHD). EKH occupies an area of 2748 km 2 and lies between 25°07” and 25°41” N Latitude and 91°21” and 92°09” E Longitude. The district is situated at an altitude of 1496 m above sea level. The district is an integral part of the Meghalaya plateau which comprises rocks of Achaean basement complex in the central and northern parts comprising gneiss, quartzite, and schist. According to the National Institute of Disaster Management, the soils of the hills are derived from gneissic complex parent materials; they are dark brown to dark reddish-brown, varying in depth from 50 to 200 cm with texture of soils varies from loamy to fine loamy. The objective of the study is to determine the natural radionuclides concentrations in soil samples collected from different locations of EKHD of Meghalaya, India. Knowing their activities, the different radiological parameters, such as radium equivalent activity (Raeq), absorbed dose rate (ADR), and annual effective dose (AED), are to be determined which would enable to estimate the exposure to radiation from the natural radionuclides present in soil samples of the study area. Soil samples (0–60 cm depth) were collected from 31 different villages of EKHD, Meghalaya. The geographical locations including latitudes and longitudes of the sampling areas are shown in [Figure 1]. Sampling was carried out from available open areas which were least disturbed. The collected samples were then placed in labeled polythene bags and transferred to the laboratory for preparation and analysis. Stones and grass were removed from the samples and then dried to remove moisture using an oven at 100°C–110°C for about 24 h. They were then homogenized and were stored in an air-tight cylindrical plastic container (3” diameter × 5” height) for 1 month (~28 days) so that secular equilibrium was attained between 226 Ra,228 Th, and their daughter products., The containers were completely filled up to the brim to allow uniform distribution of 220 Rn and 222 Rn progenies and to avoid any of their accumulation on the top. Measurements of 40K,226 Ra, and 232Th activity levels in soil samples were determined by using a flat type 3” × 3” NaI (Tl) detector housed in a graded lead shield, PC coupled MCA card (PHAST PC-8K MCA, TYPE: MC 1008) and associated relevant electronics. Gamma-ray spectrometer coupled with NaI (Tl) detector was calibrated for 0–3148 keV energy range. Energy calibration and the percentage efficiency evaluation of the gamma-spectrometer were determined using standards, RGK-1, RGU-1, and RGTh-1 obtained from the International Atomic Energy Agency. The standards were packed in similar plastic containers which were used for soil samples' storage. Counting was carried out after allowing sufficient time for attaining secular equilibrium. The samples were then placed on top of the detector, and the spectrum was acquired for 50,000 s for each one of them. The activity of 40K in the samples was evaluated from the 1460 keV peak, for 226 Ra from 1764.6 keV gamma line of 214 Bi and for 232Th from 2614.5 keV gamma line of 208 Tl. 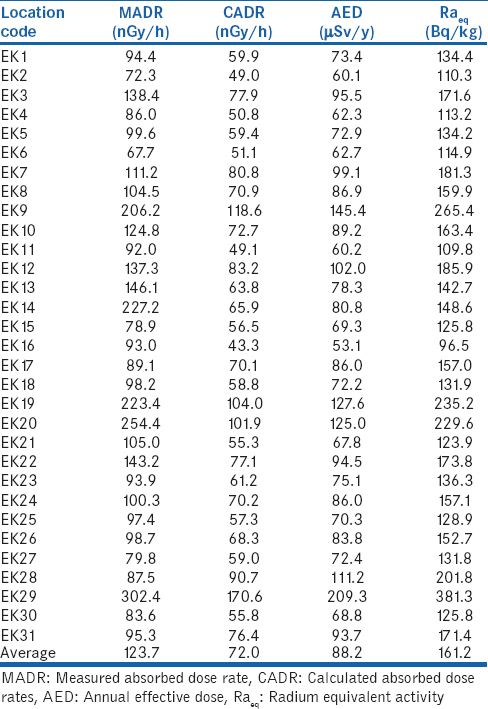 The minimum detection limits (MDLs) of our instrument for 40K,226 Ra, and 232Th were estimated using statistical laws and the background count rate of the instrument for each specific energies of the radionuclides. The MDLs of the used gamma-ray spectrometer for 650 g sample size and 50,000 s counting time are presented in [Table 1]. Where A is the specific activity (Bq/kg) of a radionuclide, N is the net peak area of a peak at energy E, B is the background count, T is the sample counting time (seconds), η is the detector efficiency, γd is the number of gammas per disintegration of the nuclide at energy E, Ms is the mass of the measured sample in kg, and σ is the standard deviation. In situ ambient (external) gamma-radiation levels in air at each site was also measured using a Micro-R-Survey Meter (TYPE: UR 705, Nucleonix) whose minimum traceable limit is 8.8 nGy/h. The survey meter was kept at a height of 1 m above the ground while measuring the dose rate. ADR due to the external terrestrial gamma radiation in air at a height of about 1 m above the ground was calculated using the conversion coefficients: 0.0417 nGy h −1/Bq kg −1 for 40K, 0.462 nGy h −1/Bq kg −1 for 226 Ra, and 0.604 nGy h −1/Bq kg −1 for 232Th. AED received by an individual was calculated from ADR using a conversion coefficient 0.7 Sv/Gy, with an outdoor occupancy factor of 0.2. Where AK, ARa, and ATh are the specific activities of 40K,226 Ra, and 232Th in Bq/kg. 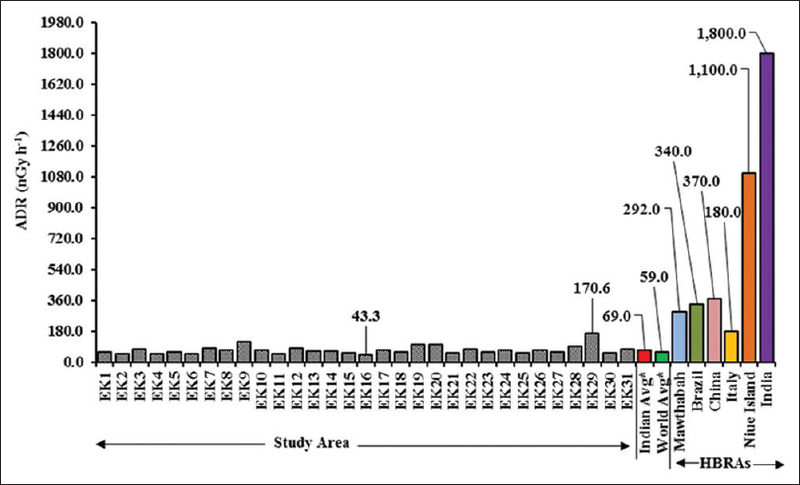 [Table 2] shows the range and specific activities of 40K,226 Ra, and 232Th in the soil samples from 31 different locations of EKHD. As can be seen from [Table 2], the minimum average activity concentrations of 40K was 96.6 Bq/kg (Sohra), of 226 Ra was 27.2 Bq/kg (Nongkynrih), and of 232Th was 39.2 Bq/kg (Mawngap). The maximum activity concentrations of 40K, 226Ra, and 232Th were measured from soil samples of Mylliem with average values of 518.0 Bq/kg for 40K, 122.1 Bq/kg for 226 Ra, and 153.4 Bq/kg for 232Th. The concentrations of 40K and 226 Ra were observed to vary from one sampling village to another under our study area. This may be explained as these radionuclides exhibit some degree of mobility and are present in soils as cations and as such tend to be absorbed in soil minerals. Higher activity concentrations of the above radionuclides were observed from soil samples of Mylliem village when compared with the rest of the sampling villages. The world average global concentration levels of 40K,226 Ra, and 232Th in the soil are 400, 35, and 30 Bq/kg, respectively. 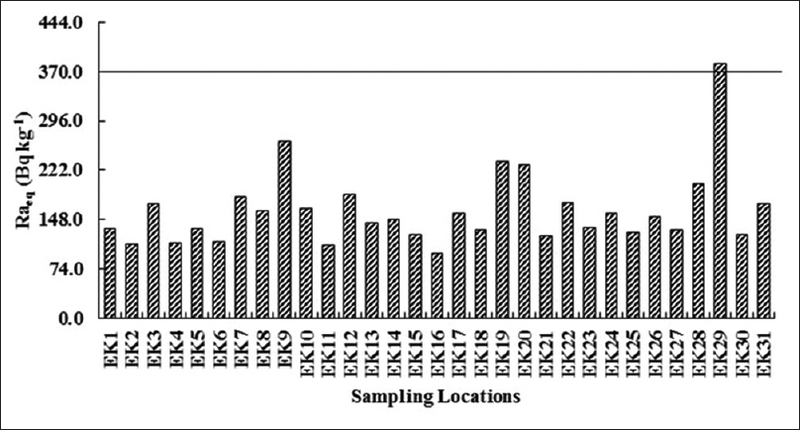 The soils samples from all sampling locations exhibited 40K activity concentration lower than the global average value, except Mylliem (EK29). Soil samples from Tyrna (EK6), Mawryngkneng (EK11), Lawbah (EK15), Mawngap (EK16), and Nongkynrih (EK21) showed average values of 226 Ra lower than the global average value while the rest showed their values to be higher. The soil samples from all the sampling locations showed their average values of 232Th concentration to be more than 30 Bq/kg. In all samples, the activity concentrations of the natural radionuclides were of the order 40K > 232Th > 226 Ra. 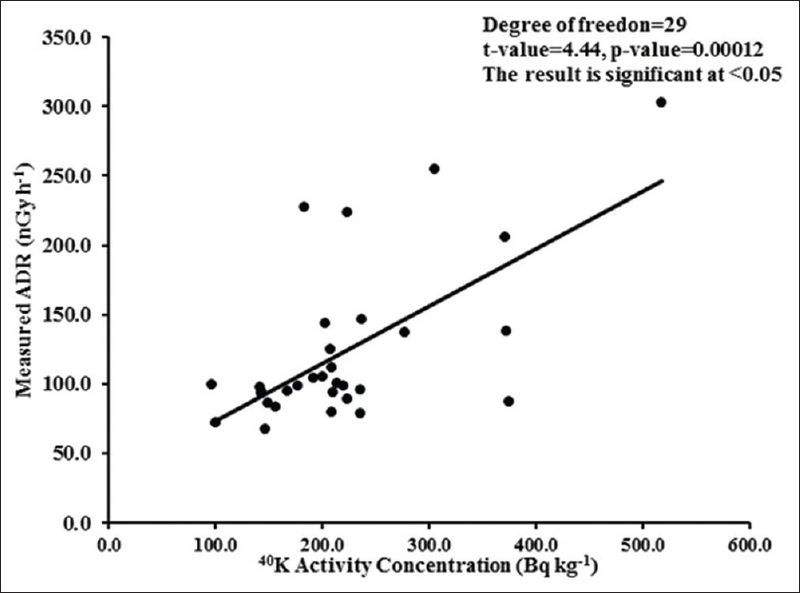 The activity concentration of 232Th higher than 226 Ra in all the sampling locations may be due to the absorbing of thorium by soil in a very immobile form. In addition,232Th/238 U ratio [Table 2] indicated a higher abundance of 232Th over 226 Ra.40K is found to dominate over 226 Ra and 232Th in all the locations as it is one of the most abundant elements found in nature. [Table 3] shows the calculated ADRs (CADRs) in air resulting of gamma radiation from the natural radionuclides present in soil samples at 1 m above the ground surface from all sampling locations. The results show that the dose rate varies from 43.3 to 170.6 nGy/h with an overall average value of 72.0 nGy/h. The obtained overall average value from the present study area is found to be slightly higher than the reported Indian average value of 69 nGy/h  and the world average value of 59 nGy/h. 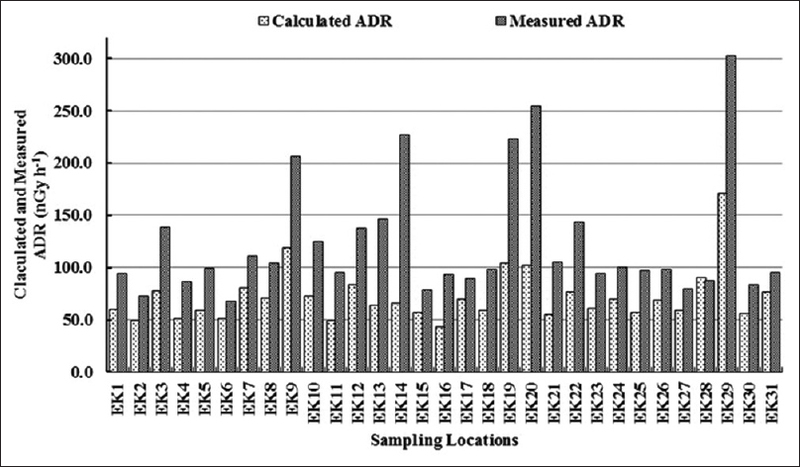 [Figure 2] shows a comparison of the average values of the ADR from the sampling villages under the study area with that of India, with the world, and also with the high background radiation areas (HBRAs)., As can be seen from [Figure 2], the obtained overall average value of ADR from the present study area is found to be much less than the HBRAs. The mean CADR and the mean measured ADR (MADR) are depicted in [Figure 3]. The difference between them might have resulted due to the treatment of the samples before spectrometry. The factors such as density, humidity, and compactness degree in situ are reported to be different between the treated samples and the dried samples. In addition, the measured dose values obtained using the radiation dosimeter are higher as it responses to the high-energy beta-rays as well as contribution due to the cosmic radiation. 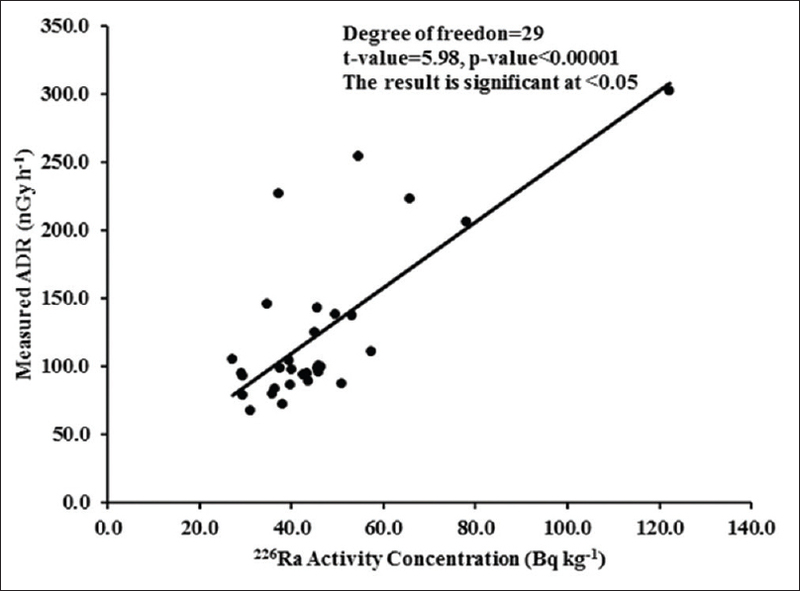 Scatter plots between the MADR and the activity concentrations of the radionuclides (40K,226 Ra, and 232Th) are shown in [Figure 4], [Figure 5], [Figure 6]. A strong positive correlation exists between 226 Ra and 232Th with the MADR, and the values are 0.74 and 0.85, respectively. This gives a picture that most of the contribution to the dose comes from the 226 Ra and 232Th series and less from 40K. The t-test at 95% confidence level confirms the significant relationship between the MADR and the activity concentration of the three measured radionuclides. 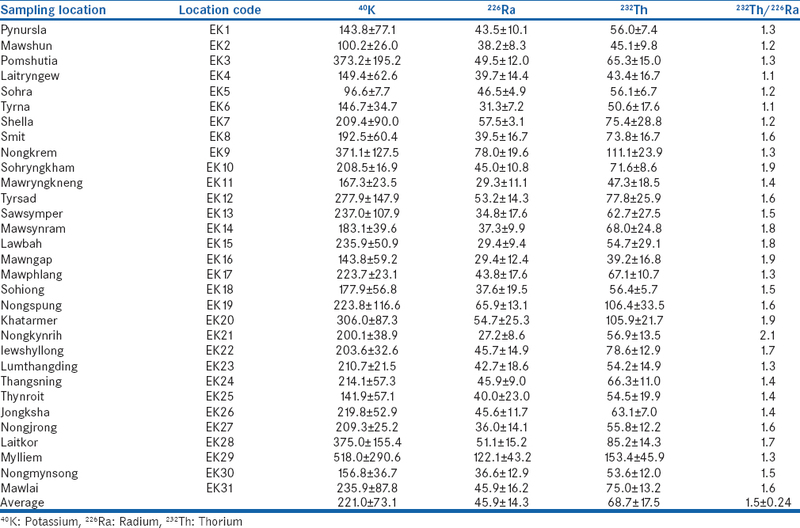 The AED (outdoor) from the selected locations ranges from 53.1 to 209.3 μSv/y [Table 3], with an overall average value of 88.2 μSv/y. The value is higher than the world average value of 70.0 μSv/y. [Figure 7] shows the AED from different sampling locations. The values of Raeq for the analyzed soil samples are given in [Table 3]. The Raeq values ranging from 96.5 to 381.3 Bq/kg with an average value of 161.2 Bq/kg show that Raeq is much less than the recommended safety limit of 370 Bq/kg. The values of Raeq from all the sampling locations as illustrated in [Figure 8] are below the safety limits which is 370 Bq/kg. For Mylliem village, the value of Raeq is slightly higher than the recommended limit. The results obtained from the analysis of gamma-ray spectroscopic data of soil samples collected from the selected areas of EKHD of Meghalaya, India, show that the average activity concentration of 40K (221.0 Bq/kg) is lower than the world average value (400 Bq/kg). However, the values of 226 Ra (45.9 Bq/kg) and 232Th (68.7 Bq/kg) are slightly higher than the world average values which are 35 Bq/kg and 30 Bq/kg, respectively. The calculated average ADR of 71.9 nGy/h from the selected locations is found to be slightly higher than the Indian average value of 69 nGy/h and more than the world average value of 59 nGy/h. However, the value is much less when compared with HBRAs. The average AED (outdoor) estimated is 88.2 μSv/y while that of the world average value is 70.0 μSv/y. 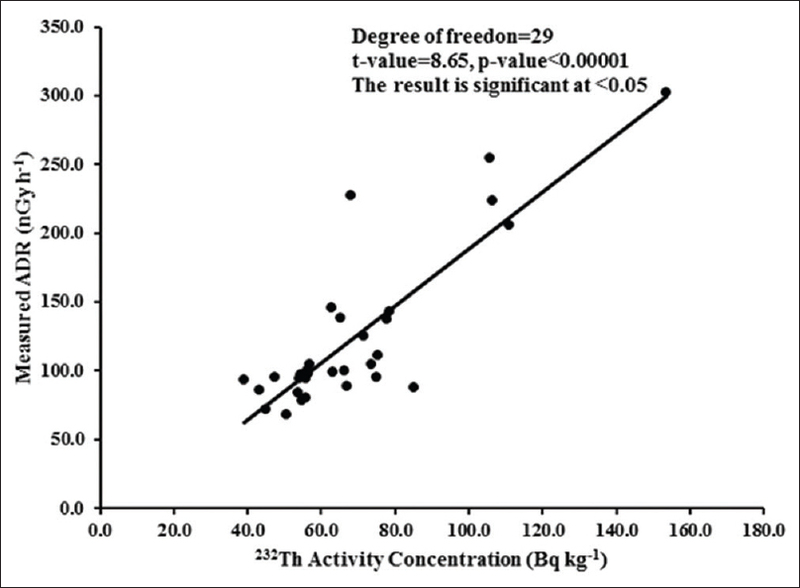 The values of Raeq as calculated from the measured activities of the radionuclides are found to be below the reported standard levels of 370 Bq/kg. The findings of our study show that the soils from all the selected, studied locations except Mylliem are safe without posing any significant radiological threat to population exposure. As for Mylliem village, more research work has to be carried out to have a better understanding of the high concentration of the natural radionuclides. We are thankful to the Atomic Minerals Directorate, NER, Shillong, for the help rendered to us in getting the samples crushed homogeneously. International Atomic Energy Agency (IAEA). Radiation Protection and Safety of Radiation Sources. International Basic Safety Standards Interim Edition. Part 3. Vienna: IAEA; 2011. Kolapo A, Kazeem A, Caleb A. Determination of natural radioactivity and hazard in soil samples in and around gold mining area in Itagunmodi, South-Western, Nigeria. J Radiat Res Appl Sci 2014;7:249-55. Dabayneh KM, Mashal LA, Hasan FI. Radioactivity concentration in soil samples in the southern part of the West Bank, Palestine. Radiat Prot Dosimetry 2008;131:265-71.
International Atomic Energy Agency (IAEA). Regulation for the Safe Transport of Radioactive Material. Radiation Safety. Vienna: IAEA; 1996. Santawamaitre T, Malain D, Al-Sulaiti HA, Bradley DA, Matthews MC, Regan PH, et al. Determination of (238)U, (232)Th and (40) K activity concentrations in riverbank soil along the Chao Phraya river basin in Thailand. J Environ Radioact 2014;138:80-6. Song G, Chen D, Tang Z, Zhang Z, Xie W. Natural radioactivity levels in topsoil from the Pearl River delta zone, Guangdong, China. J Environ Radioact 2012;103:48-53. Turhan S. Assessment of the natural radioactivity and radiological hazards in Turkish cement and its raw materials. J Environ Radioact 2008;99:404-14. United Nations Scientific Committee on the Effects of Atomic Radiation (UNSCEAR). Sources and Effects of Ionizing Radiation 1, Annex B. Report to the General Assembly, United Nation, New York; 2000. El-Shershaby A. Study of radioactivity levels in granite of Gable Gattar II in the north eastern desert of Egypt. Appl Radiat Isot 2002;57:131-5. Tzortzis M, Tsertosa H, Christofides S, Christodoulides G. Gamma-ray measurements of naturally occurring radioactive samples from Cyprus characteristic geological rocks. Radiat Meas 2003;37:221-9. War SA, Nongkynrih P, Khathing DT, Iongwai PS, Jha SK. 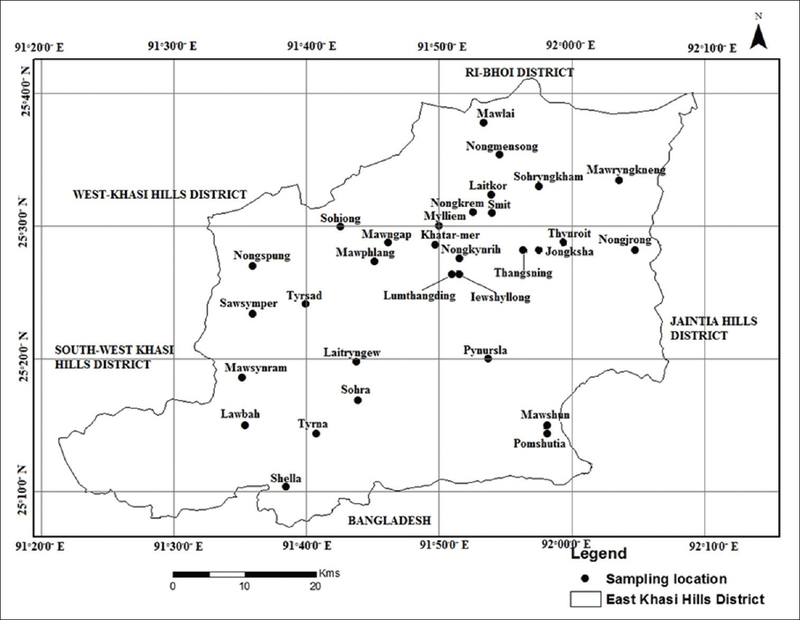 Spatial distribution of natural radioactivity levels in topsoil around the high-uranium mineralization zone of kylleng-pyndensohiong (Mawthabah) areas, West Khasi Hills district, Meghalaya, India. J Environ Radioact 2008;99:1665-70. Ding X, Lu X, Zhao C, Yang G, Li N. Measurement of natural radioactivity in building materials used in Urumqi, China. Radiat Prot Dosimetry 2013;155:374-9. Rangarajan C. Analysis of gamma spectra and statistical errors in counting. In: Asian Regional Workshop on Methods of Analysis of Radionuclide Contaminants in Food. 1989. p. 138-61. United Nations Scientific Committee on the Effects of Atomic Radiation (UNSCEAR). Sources and Effects of Ionizing Radiation 1, Annex B. Report to the General Assembly, United Nation, New York; 2008. Organization for Economic Cooperation and Development (OECD). Exposure to Radiation from the Natural Radioactivity in Building Materials. Report by a Group of Experts of the OECD Nuclear Energy Agency. Paris, France; 1979. Sowmya M, Senthilkumar B, Seshan BR, Hariharan G, Purvaja R, Ramkumar S, et al. 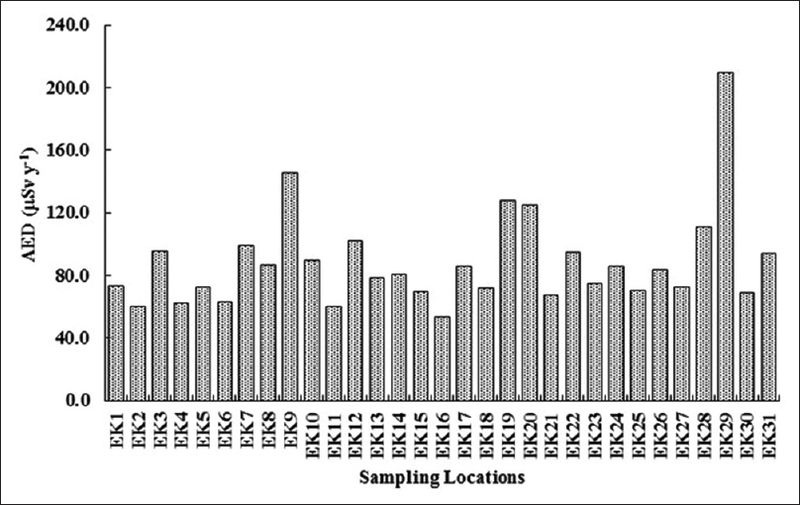 Natural radioactivity and associated dose rates in soil samples from Kalpakkam, South India. Radiat Prot Dosimetry 2010;141:239-47. Schulz RK. Soil chemistry of radionuclides. Health Phys 1965;11:1317-24. Kukreti BM, Sharma GK, Kumar P, Hamilton S. Interpolation study on ambient gamma levels in parts of Khasi Hills, Meghalaya (India): Preliminary findings for U exploration. J Earth Syst Sci 2016;124:737-44. Ray J, Saha A, Ganguly S, Balaram V, Krishan AK, Hazra S. Geochemistry and petrogenesis of neoproterozoic mylliem granitoids, Meghalaya Plateau, Northeast India. J Earth Syst Sci 2011;120:459-73. Kamath KK, Menon MR, Shukla VK, Sadasivan S, Nambi KS. Natural and Fallout Radioactivity Measurement of Indian Soils by Gamma Spectrometric Technique. Proceedings of the Fifth National Symposium on Environment. Bhabha Atomic Research Centre, India; 1996. p. 5660. Freitas AC, Alencar AS. Gamma dose rates and distribution of natural radionuclides in sand beaches – Ilha Grande, Southeastern Brazil. J Environ Radioact 2004;75:211-23.